There is so much talk amongst enthusiasts about Sig Sauer. If you go shooting at all, or have friends who do, then you know about Glock and also Sig Sauer. 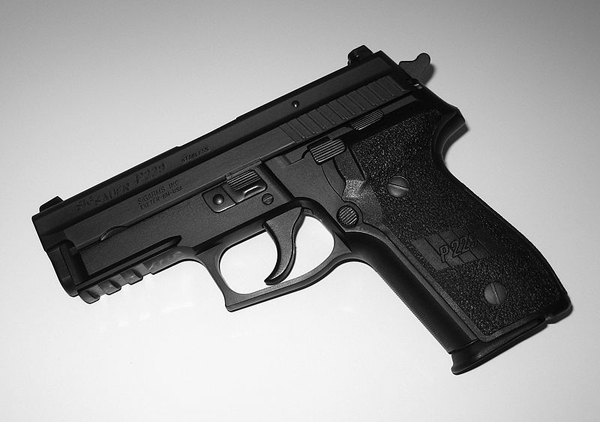 The SIG P229R was the first pistol to be manufactured in Exeter, New Hampshire. Available in 9mm, .40 S&W and .357 SIG, the P229R is one of the most popular Sig Sauer pistols. 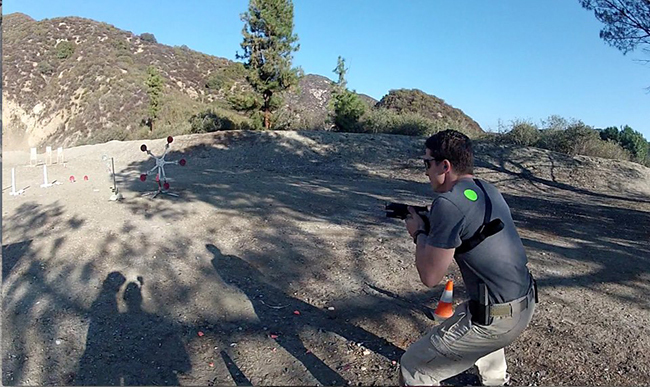 Carried by thousands of law enforcement professionals throughout the country, we found it to be a good test product. The compact size of the P229R makes it ideal for duty or possibly concealed carry. The model we tested was chambered in the speedy 357 SIG cartridge. My First impressions of the firearm where very positive. The finish is nice, it is balanced well, and fit my hand perfectly. I am 5'11". It pointed nice and it looked and felt like a quality firearm. The slide was easy enough to work and very smooth. All the controls were conveniently placed where God intended. The magazine falls free with ease when the release is pressed. The P229 features a locked breach, aluminum frame, de-cocking lever, accessory rail, and Sig's night sights. It has a 10lb. double action first pull followed by 4.5lb single action trigger pull. It's weight is 32oz. with empty magazine. Ours came with 2 double stacked mags which when not in California can hold 12 rounds. The grips felt very secure which made me confident I would be able to hang on to this 357 canon. The P229 is a pretty common handgun, so magazines , holsters and accessories are pretty easy to find on amazon or your local gun shop. I must say I was a bit intimidated at first by the 357 SIG cartridge. I own a Ruger GP100 in 357 Magnum, and hot loads really boom. I typically shoot .38 Special loads in my 357 because I find them much more pleasant. Now knowing that this gun was lighter than my Ruger and the ballistics are some what comparable, I really didn't expect to put a ton of rounds through it. Upon the first shot, I realized I was dead wrong. I squeezed the trigger five more times and after each round my smile grew larger. This gun recoiled less than a .40S/W. It was almost like shooting a 9mm but with more volume. 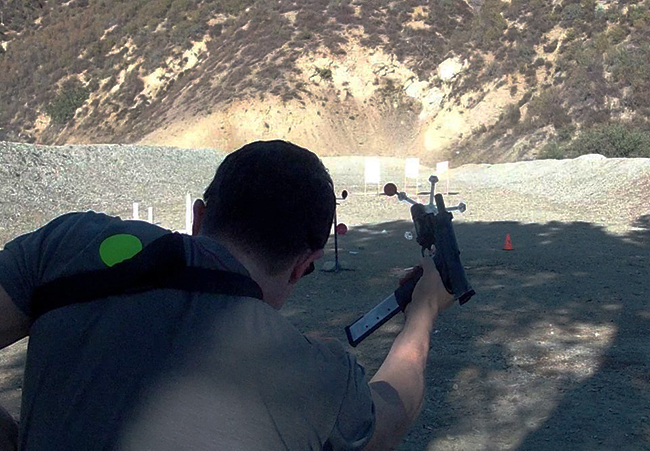 It was quick recoil, but it had more of a "push" like that of a 45ACP. After another 3 shots I actually checked the markings on the slide to be sure this was in fact a 357. It was. The SIG night sights on this pistol are set up to use a "combat" sight picture. This is where the front sight completely covers the bulls eye of the target. With 10 rounds, at 25 yards I was able to hit a large sparklets bottle filled with sand 9 of the 10 shots. The P229 even at that distance was more accurate than I. I fired several more magazines at distances of 7 yards, 15 yards at various size targets and was I pleased with my results every time. This SIG is a tack driver. If you are capable, the bullets will obey. They go where you tell them. We decided to take it a step further. The Sig Sauer motto is "To hell and back." We decided to bury it in the sand and jump on it several times. We then pulled it out ejected the magazine and dropped the gun and mag in a bucket of muddy water. Next we cycled the slide a few times and proceeded to shoot another 50 rounds flawlessly. We figured what the hay, stick it in the mud at the bottom of the bucket. We pulled it out again and without a rinse launched 50 more mud splattering rounds. Because we had to give it back, I wanted to field strip, rinse and lube the whole thing we left. My good intentions were wasted. No sooner did I finish, our team grabbed it and fired it again. I guess they were not finished with it yet. It was as if everyone was waiting for more trigger time with it. It was popular that day to say the least. Throughout the rest of the day the SIG continued to perform nonstop. We counted the empty boxes of 357 rounds. All the shooters included, we ran just under 1300 rounds. Some hollow point, some flat point. Some Cor-Bon, Hornady and Speer. We had not one failure to fire or failure to eject. Just for giggles and comparison, we also brought a Wilson Combat Elite Pro 1911 chambered 45ACP along side this SIG. This model Wilson is a fair 1911 to compare as the BBL is also 4 inches as opposed to the full size 5" 1911. I just wanted to see how it stacked up against my favorite platform the 1911. When I switched to the Wilson, I had expected my results to improve. I thought I was having a good day, and I couldn't wait to do even better with the 1911. To my surprise, I was more accurate with the SIG P229R. I could down saw blades, clay pigeons, and water bottles like I was pointing my finger. It was so natural it seemed effortless. Surpirised? Yes I was. Amzed? No, not at all. It is a Sig. There are as many die-hard SIG fans out there as there are CZ, and Glock fans, and now I understand why. The P229 is exactly why. I have shot Glock's, S&W, Springfield, Taurus, Wilson Combat, Ruger, CZ, Kimber, FN Herstal, HK and many revolvers as well. This SIG P229R is now on my "all time favorite handguns" list. It was pleasant, it was accurate, and it was reliable. The night sights drop free mags and quality finish were an added bonus. While I do not see myself replacing my GP100 357 Magnum with this gun, I do shoot it better, it carries easier, holds more rounds and the ballistics are close to the magnum. I had an afterthought. When I get one, (and I will) I don't know if I will use the accessory rail. I found this gun to be so balanced and so perfect that I would not add or take away anything that could effect that. I am extremely pleased with it right out of the box. Well done SIG. 1 in 10" 1 in 15" 1 in 16"
27.5 oz. 27.5 oz. 27.5 oz. 3.0 oz. 3.0 oz. 3.0 oz. what are your thoughts on the sig p229?